Son of Richard Hamer (1846-1922), and Clara Louisa Pattenden (1851-1903). Son of Maj. Frank Buckland Hardy, OBE. Colonel Commandant, RM, 1961-1966. Director of the Coal Utilisation Council, 1960-1970. Son of John Waugh Harris (1873-1920), and Ethel Marion Mountford Scrivener (1875-1962). Married (12.09.1950) Pamela McGregor Ritchie; five children. Son of John Harvey, and Maria Elizabeth Sturman. Innovative sailor, founder of the Single-handed Transatlantic race (1960), and inventor of the first effective self-steering gear for yachts. Son of Charles Albert Hasting (1885-1947), and Mildred Helena Moody (1888-? ), of Wolborough, Brixham & Chiswick. Married 1st ((09? ).1947, Devon Central district) Ann R. McCausland, daughter of Maj. F.M. McCausland, The Royal Scots, and Mrs E.C. McCausland (later Becher), of Dunsford, nr Exeter; one son. Married 2nd ((03? ).1955, Bromsgrove district, Worcestershire) Joyce Vielvyn Relph (03.09.1929 - 11.1989); one son, one daughter. Enlisted as a recruit to the Corps 1940 and served for two years in the ranks becoming corporal before his selection for a War Service Commission in 1942; he translated in 1946 to a Regular Commission. His war service centred on the Mediterranean, participating in the Allied invasions of Sicily and of Italy in 1943 and he had a narrow escape from a shell, which killed three of his marines on the day of the allied invasion of mainland Italy. From July 1944 until Victory in Europe he was OC RM Detachment and Naval Provost Marshal in Algiers. Hasting joined the aircraft carrier Unicorn in Hong Kong 1950, soon after North Korea invaded South Korea. In August that year, Unicorn sailed with a British Infantry Brigade HQ and two British Infantry Battalions to the relief of besieged Pusan; the first non-US reinforcements to South Korea. He remained with Unicorn in Korean waters until 1952, when he was appointed in the rank of Captain as Aide-de-Camp and Personal Secretary to HM Governor of the Bahamas. Returning to the UK 1954 he became Adjutant to the Royal Marines Reserve (City of London) and in his off-duty time was Chairman of the House Committee of the Army and Navy Club (‘The Rag’). In 1960 he became the first non-US Officer to be selected as Aide-de-Camp to the Supreme Allied Commander Atlantic, Adm Robert Dennison, US Navy, in Norfolk, Virginia, and was at the nerve centre of the Cuban Missile crisis of October 1962. In retirement he organised the annual Poppy Appeal for five villages and was a member of the Poole & District branch RMA. His parents ran a pub opposite the RM Barracks at Eastney. Married Muriel Ackland; one daughter, one son. Married Phyllis Maude Dye (1906 - ); one daughter. Son of Capt. Cuthbert Joseph Hay (1882-?) and Letitia Griffith Fausset. Married (24.10.1944) Third Officer Barbara Grange, WRNS, daughter of George Rockfort Grange; two sons, two daughters. Son (with two sisters and two brothers) of Owen Chilton Goodenough Hayter (1876-1964), and Violet Mary Wakefield (1879-1947). Married (04.12.1931, Widley, Hampshire) Emma Eugenie Masson (29.09.1906 - 05.1959), of Littleham, Devon, daughter (with three sisters and three brothers) of Percy George Vivian Richardson Masson (1870-1958), and Martha Minnie Godley (1870-1959); two sons, two daughters. Son (with one sister and one brother) of Robinson Hedley (1882-1911), and Annie Messam (1880-1970). Married (02.08.1930, Plymouth district, Devon) Violet Elsie May Roberts (23.09.1909 - 20.07.1974); one daughter. Farmed a small farm near Exmouth until the early 1970s, then moved to a retirement bungalow in Crafthole near Plymouth. The stepson of his daughter writes: "He died in a slightly bizarre manner when he was with his wife driving onto the ferry at Torpoint when he had a heart attack and the car drove into the sea, drowning his wife. He was probably dead already. Coincidentally some years later I met a Torpoint ferryman who is distantly related to my brother in law and he had swam to the car as it floated away but as he managed to get the door open the car sank immediately. A sad end for such a brave man." Twin son of John G. Hetherington, and Blanche Thomas, of Kingswood, Surrey. Education: Imperial Service College, Windsor (09.1938-12.1941; "C" (Lawrence) House; Sixth Form; 2nd XI 1941, 2nd XV 1941, Athletics 1940). Obituary from his parish magazine: "Edward (Ned) Hogg was born in Canton, China on 11th February 1919. Two of his earliest memories were of the Royal Navy Gun Boats on the West River, and the church where his Mother Edith was the organist and where he was given a bottle of fizzy lemonade if he pumped the organ satisfactorily. In 1925 he began his early education in England at a Boarding School in Crabtree Furlong, Buckinghamshire, run by his Father’s eldest sister – Aunt Lottie. His schooling then finished at Monkton Combe school in Bath, where he was a keen member of the Rugby Team. He used to speak of fun days out, and ski holidays – before the days of ski lifts. He started his training in the Square and Gym with the Royal Marines at Plymouth in 1937, followed by the normal round of training to complete his office education: Eastney, Whale Island; Gunnery HMS Iron Duke; Seamanship and Navigation HMS Vernon; Electricity and Torpedoes RM Barracks Chatham; Admin and Military Law RM Deale; Military Course and Tactics Gosport, Hants; and Small Arms School before being posted as Acting Lieutenant to HMS Edinburgh in August 1939. It was in the Edinburgh that he witnessed the first air raid on the 16th Oct.1939 whilst in harbour at Rosyth, seaward from the Forth Bridge. In April 1940 he joined the Ark Royal in Portsmouth and sailed almost immediately for Alexandria in Egypt for Flying Training. Then, hurriedly back to Greenock for the Norwegian campaign, where his memories were of 24 hours daylight and the resultant constant bombing. In June 1940, at the time of the evacuation of Dunkirk, he sailed with the Ark Royal for Gibraltar where it blew up the French Fleet to prevent it from joining the Nazis. He states in his memoirs ‘This was not a happy episode’. He left Ark Royal in April 1941 and in June, at the age of 22, was made Acting RM Captain of HMS Dorsetshire, where he had the fabulous surprise of an increase in his pay from nine shillings to twenty-five shillings a day. In Dec.1941 the Allies, including America declared war on Japan, and the Dorsetshire was deployed to the Indian Ocean, carrying troops to Singapore. On Easter Day 1942 his ship was sunk by Japanese bombers off Ceylon, and Ned had to swim in shark infested waters for 36 hours. He was eventually picked up by an Australian Destroyer, and finally arrived at Liverpool on the Empress of Russia, via the Maldives and Mombassa, in July 1942. He caught pneumonia, and spent some weeks in the RN Hospital at Stonehouse. On recovery early in 1943 he was appointed RM Captain of HMS Emerald which was due to join the Eastern Fleet based in Ceylon. Having made the long journey via the Cape in January 1944, he returned via the Suez Canal and the Med. to give support for the D Day landing in Normandy in June 1944. Specifically, he supported the legendary 47 RM Commando raid which was compared with the action at Pegasus bridge by the then Commander of the 2nd Army (General Dempsey). In this action, he was awarded a Mention in Dispatches. On the home front, it was during this time that he met again with Angela, a Wren Officer whom he had met previously at Plymouth. They were married on 15th Dec. 1944 in Mayfair, London: a marriage that was to last 57 years. On VE day in May 1945, he was at HMS Woolverstone in Suffolk where his new wife left the WRNS to join him. He retired from the Royal Marines in 1958, after various appointments in Argyllshire, Hamburg and Bermuda, and settled in Westbury on Trim, Bristol, with Angela, and their three children (Richard, Jenny and Christopher). He set up in business, becoming a Director of Bristol Merchant Finance Co. Ltd. In 1968 the Company was floated on the London Stock Exchange and subsequently sold. Ned continued a branch of the business in Cyprus, but following the invasion by Turkey in 1974 living there became untenable. He did however remain in contact with his friends there, and continued to enjoy caravan visits to them. Ned moved into Amberley House, Pettistree in August 1982 with Angela, where they enjoyed village life. He played golf at Thorpeness, and we remember him well playing cricket with his family in the early days of village cricket. Sadly, Angela suffered a severe stroke in 1990 and Ned spent many years caring for her, until she sadly passed away on Nov.1st 2001. He was a very proud grandfather to six grand-children and three great grand-children, all of whom enjoyed his robust humour, strong affection and ready supply of chocolate. The Corps was never far away in Ned’s life and it was no surprise when his son (Richard) and grandson (William) followed in his military footsteps - both were commissioned into The Light Infantry and served from Aden to Bosnia to Northern Ireland. Ned was a very regular member of the Church, and a most valuable and committed Church Warden for many years, taking great care of the church yard which he was keen to promote as a significant nature reserve. We remember him as always managing to find time for his friends and neighbours, being ready with a joke, sharing his garden produce and giving his time to care for others. He spent Christmas 2007 with Christopher in Norfolk after having sadly learnt of the death of his eldest son Richard. He went to Bristol for Richard’s funeral at St. Mary’s Redcliff, but became unconscious on the morning of the funeral and died, surrounded by his family, on 6th January 2008. The Last Post and Reveille were played at his funeral in Pettistree Church on 17th January by a Marine Bugler, and the White Ensign was draped over his coffin." Elder son of H.F. Stanley Holford, and Mrs Holford, of Horsham, Sussex. Married 1st (31.03.1930, St Michael's Church, Bournemouth, Dorset) Aileen Margery Rees, younger daughter of Dr and Mrs Rees; one daughter. Aileen Holford remarried (1949) Sydney C. Woolley. Son of late Rev. Canon C.J. Hollis, MA. Married (1922) Rose May Fraser; no children. Education: St Lawrence's College, Ramsgate. 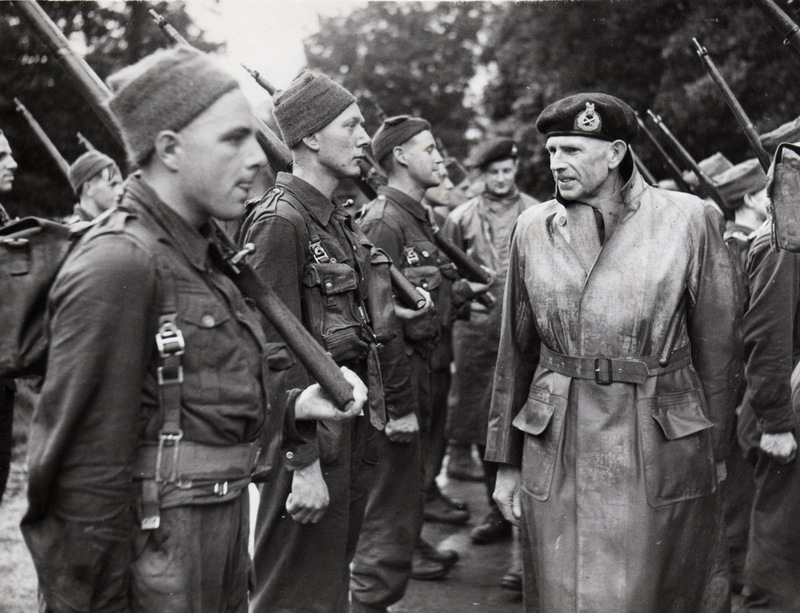 Commandant General, Royal Marines, 26.05.1949-20.05.1952. Member Institute of Directors. Company director and author. Published: One marine's tale (1956); War at the top (by James Leasor, based on the experiences of General Sir Leslie Hollis, KCB, KBE) (1959); The Captain General (1961). Married (04.03.1924, Malta) Rozalia Schlesinger, daughter of Janos Schlesinger. died between 08.1989 and 12.1998 ? Personnel & Records Office, RM ? Played rugby for England, 1949-50. Son of John Mayo Houghton, and Lucy EvelynTrotman, of Dawlish, Devon. Married (1940) Dorothy Uladh Lyons (28.09.1912 - 10.1995), youngest daughter of Maj.Gen. R.W.S. Lyons, IMS; two sons, one daughter. Education: Haileybury (3rd term 1925-2nd term 1930). Colonel Commandant, Royal Marines, 01.01.1973-31.12.1976. General Secretary, Royal UK Beneficent Association, 1968-1978. Deputy Lieutenant (DL) East Sussex, 1977. Son of Alfred and Eliza Howard. Son of Theodore Hunton, and Emma Maria Hunton. Married (08.09.1919, Clifton, Bristol) Margaret Mary France Steele, daughter of Lt.Col. W.H. Steele, late RAMC; one son (one daughter deceased). Beaufort Testimonial and the Wharton Testimonial with Gold Medal Education: Clifton College. Qualified as interpreter in Japanese. Honorary Colonel Commandant Portsmouth Group RM, 01.02.1949-30.10.1950.